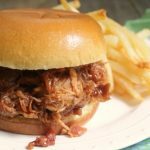 Bacon and bourbon pack on the flavor big time in this amazing recipe for Crock-Pot Bourbon Bacon BBQ Pulled Pork! This recipe will impress your guests! Pulled pork is one of those classic slow cooker recipes that just about everyone knows how to make. You throw in a pork roast let it cook, shred the meat and add some bottled barbecue sauce. And voila you have a basic pulled pork. But I am always looking for new ways that I can up the flavor on a classic recipe and take it from “good” to ‘WOW”. And the addition of bacon AND bourbon in this recipe does the trick! A pork shoulder roast is rubbed down with a homemade sweet and spicy rub and cooked all day in your slow cooker with a little bit of bourbon. While your pork cooks away you go ahead and fry up some thick sliced bacon until it is nice a crisp and set that aside. Once your pork is falling off the bone, shred up that meat. Add in the crispy bacon, more bourbon and your favorite bottled (or homemade) BBQ sauce and mix it all up and let it cook just a little bit longer. The bourbon does not cook off in this recipe. So if you are adverse to some booze in your meat (or serving this to kids) you may want to skip the bourbon. Serve the boozy bacon-y pulled pork on some nice toasted buns (I found some amazing brioche buns at my local grocery store) or rolls and be prepared to be impressed! 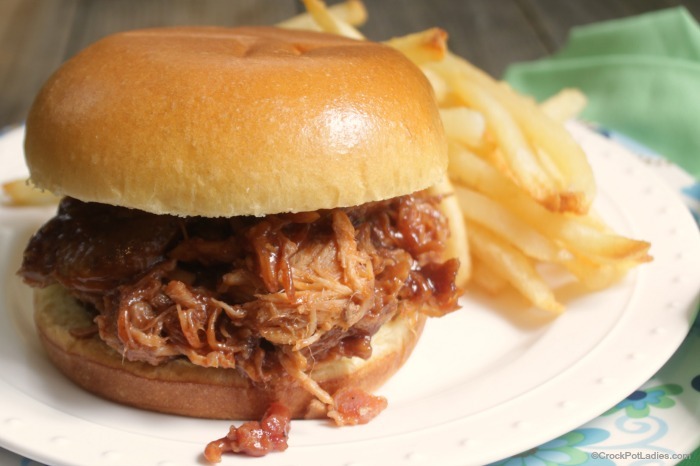 Bourbon and bacon takes this delicious pulled pork over the top in flavor. This recipe is sure to impress your family or guests with the great flavor combination. In a small mixing bowl, combine all of the ingredients for the Sweet & Spicy Rub until well combined. Place pork shoulder roast on a rimmed baking sheet and rub all of the spice rub into the meat. Covering all sides. Place pork shoulder roast into the bottom of a 6 quart or larger slow cooker. Pour 1/4 cup of the bourbon over the top of the pork shoulder roast. Cover and cook on LOW for 8 to 10 hours until the pork is super tender and falling off the bone. While the pork is cooking in the slow cooker, chop the thick sliced bacon and cook in a frying pan on the stove-top until crispy. Drain off fat and set the bacon on a paper towel lined plate in the refrigerator until the pork is cooked. When the pork is cooked and tender, carefully remove the pork roast from the slow cooker and place on a rimmed baking sheet. Discard the cooking liquid from the slow cooker. Shred pork with two forks and place shredded meat back into slow cooker. Add the cooked bacon, barbecue sauce and remaining 3/4 cup bourbon to the pork in the slow cooker and toss to mix and coat the shredded pork in the BBQ sauce. Recover the slow cooker and continue to cook an additional 1 hour on LOW or set your slow cooker to WARM for at least 2 hours to bring everything in the slow cooker (including the cold cooked bacon) up to temperature. 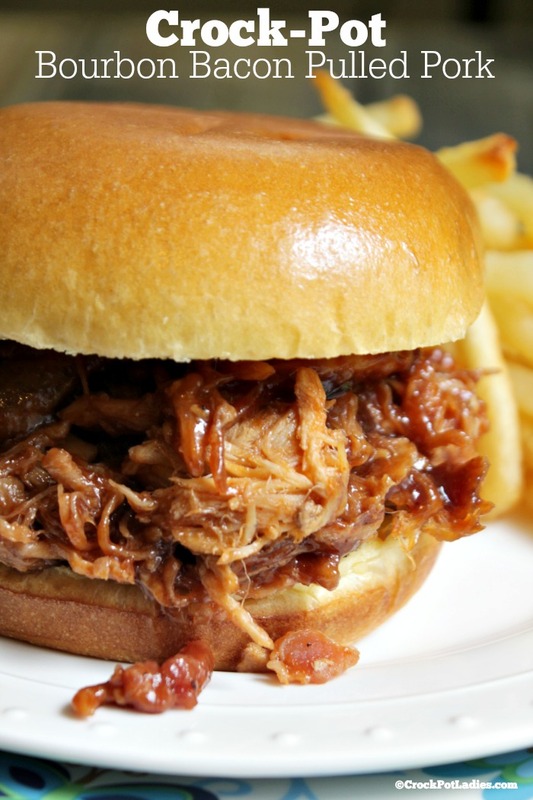 Serve pulled pork on your favorite buns or rolls as sandwiches.